Tuval Schneerson, the young and prolific Brighton songwriter was launching his EP ‘Obscure Salvation’ tonight at The Hope and Ruin, the night was received with a swarm of anticipation. It was busy, bodies everywhere, besieged by familiar faces from the Brighton music scene, clearly Tuval had done something to tickle their cherries. You know Tuval is something special when he can confidently confront the audience, question them and make the whole shabazz look so damn effortless and casual. Hell, you know Tuval is on a path to somewhere great when he has the gusto to get up there and cover ‘Break On Through (To The Other Side)’ with such charisma and energy whilst nailing it to the point where Jim can give a slight salute from his grave. However, first up was Wax Machine…. 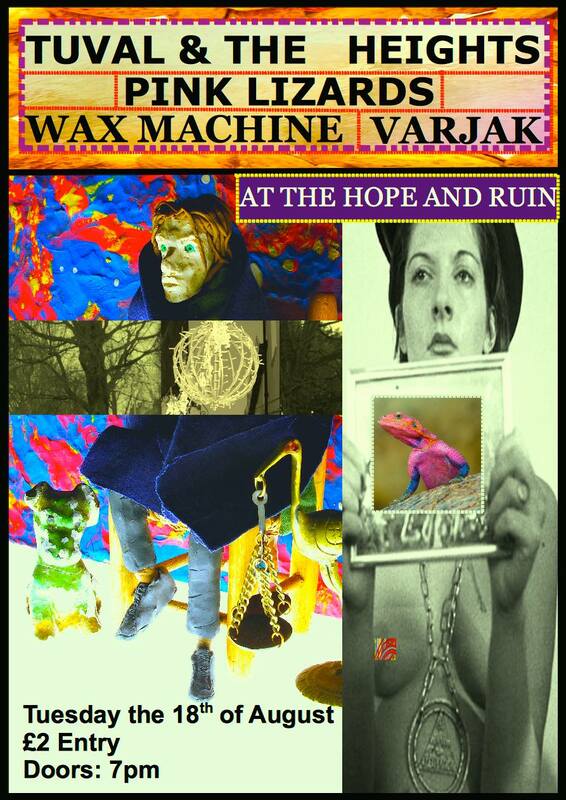 Wax Machine, I do not know how you have hidden away from us for this long. Arriving to the venue midway through the set to a lamenting howl, a billowing rush of hair spinning across the intimate stage, six members holding their own, colliding and ricocheting across walls and one another, they had commanded me under their spell. Seeming like a fully fledged and unashamed kick back to the 60s, the whole thing made so much damn sense with the Earth like ethereal mirror ball rotating in the corner. Displaying the charisma and menacing moves of Mick Jagger, the altogether band image and overarching guitar lines that summon a steady rhythm was a kick back to 60s psych revivalists, The Brian Jonestown Massacre or even the West Coasters in the heyday, tinges of Surrealistic Pillow. Packed between was a sense of Foxygen with the inventive song structures, the ever impending danger of complete collapse but more than anything, the intrigue, the pull and excitement that Wax Machine could convey. Probably the best support act I have seen since residing in this city. Up next and the reason we are congregated in this building in the first instance, Tuval. What instantly grabs you about this young chap is his charm and personality, the casual affair with how he treats the whole thing, the genuity behind his voice is something appealing, the down to Earth nature. Launching his EP and showcasing his set which is drowned in influences, everything from the intricacy and flair of Jeff Buckley to heady renditions of West Coast psychedelia, to the isolation of Spiritualized and to the bluesy jams we are treated to tonight, hazed with ideas of Stevie Ray Vaughan. ‘In My Head’ opens with a coolness and effortless playing style, deluged in a drunken reverb with a misted voice over laying it, building to an angst and passion – any subtlety and cohesion is undercut with abrasion and noise by the climax and it’s such a release. The title track ‘Obscure Salvation’ is executed in a similar style, beginning with a folk-like finger pick that commands the kick drum, catching everybody wiggling a little to it’s own steadfast beat or dictating the sternum-thumping whipcrack of a grown man’s hand upon his chest. Tuval whispers sweet nothings that hover upon lingering guitar lines like birds upon impending seas. It was a real treasure to witness Tuval going from strength to strength, each time his set becomes slightly more perfected, slightly more fine tuned, something is going to come good for this young chap and if it does not, there’s something misguided in this world. Here’s hoping.